This entry was posted on Saturday, January 2nd, 2016 by Frances Ryan. Right. It’s a New Year and therefore time to state my new running goal. And for the first time in a long time, my goal doesn’t include a full marathon. It’s hard to say that, but I know it’s the right decision at this point in time. Especially because training for a full marathon really impedes my ability to hit my half marathon goals. So with that: I hereby declare that my 2016 running goal is simply to run a sub-2.00.00 half marathon. Yes, I know I just said “simply” in regards to running 13.1 miles. And yes, I know there’s nothing simple about it. 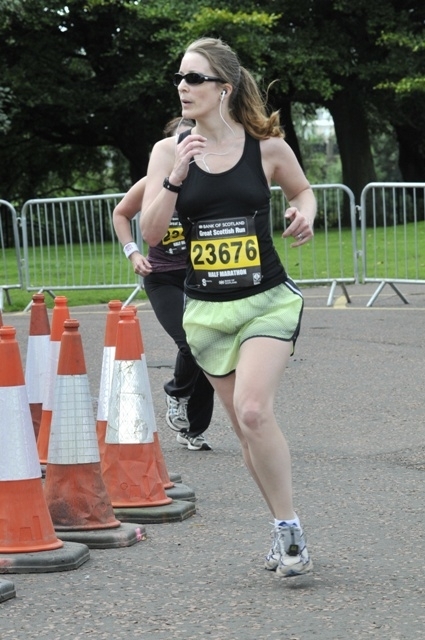 But I do believe that if I concentrate on my half marathon distance, I will be able to improve. And that improvement will eventually lead me to a sub-2 finish. Which means I need to shave about one minute off of each mile from my previous best time of 2.12.02. Do-able? Yes!! But it’s going to require a lot of hard work. My race partner from the past couple of years has other weekend commitments in 2016 so will not be joining me, so I’ll be back to running solo again. And that’s totally cool. However, if anyone wants to run a race with me, you’d be more than welcome to lace up and join me! I will also be running the Great Winter Run here in Edinburgh on 9th January. It’s “only” a wee 5K but it should be a bit of fun. I am going to try to be better at training for this year’s races, too. And not just by running more, but by doing some weight lifting and other bits of cross-training, too. And not just for the running goals, but rather for that long-term, life-long goal of being happy. Stay tuned to see how I get on! And I wish you all the best with whatever goals and plans you’ve set for yourself this year!